The frustration of living with CRPS spills over into everyday life we would all agree. 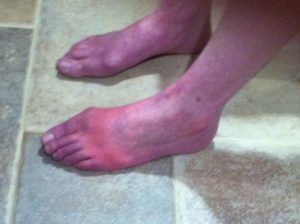 Yet, speaking as a CRPS patient and Nurse, I have gained a unique point of view both as the health professional and now as the patient. Yet, my vulnerability as a patient was tested from an ER visit for acute abdominal pain and CRPS flares of my GI/colon. There isn’t a ton of documentation on CRPS in the GI system, including the colon. But that doesn’t mean CRPS isn’t an issue there. CRPS can spread to ALL aspects of the body, including our internal organs. Bladder dysfunction, bowel dysfunction and abdominal pain can be affected according to the April 2014 online health chat with Dr. Michael Stanton Hicks, board certified physician in pain management and anesthesiology at Cleveland Pain Management and Center for Neurological Restoration. Additionally, an article written by Dr. Robert Schwartzman, “Systemic Complications of CRPS”, Neuroscience & Medicine, 2012; documents spread to “internal organs” including GI. Information referenced by Dr. Eamonn Quigley and Ronald Pfeiffer links gastrointestinal dysfunction in patients with neurological disease. “Neuro-Gastroenterology” published by Elsevier Health Sciences explains the “brain-gut connection”. Why, then, is it such a struggle to connect the dots? Can’t tell you how many medical professionals have said: “I don’t know what CRPS or RSD is, but it can’t possibly be related to your GI system/colon.” If you say you do not know what CRPS/RSD is, how can you then make such a statement? You would think as an RN I wouldn’t be faced with this. But even though I was prepared (having my CRPS card and ER/Hospital Protocol from RSDSA, along with a list of medications, medical history and doctors in my wallet at ALL times), I still faced added stress of some staff NOT understanding or interested in knowing about CRPS. Imagine this: I am laying on an ER stretcher, moaning in pain, holding my discolored “burning belly”, with my multi colored feet handing out of sheets, vulnerable, and overwhelmed trying to figure out how to just get relief when a hospital staff doc pays a 5 minute visit to my bedside spurting out what he is going to do while I, the patient and nurse, try to explain what CRPS is by handing him the CRPS card from RSDSA. My hope: this will communicate what I can’t speak right now. Instead I only get the “nod” of an uninterested medical professional putting the card back down without even looking at it, which causes me to feel MORE vulnerable, disrespected and in MORE pain. 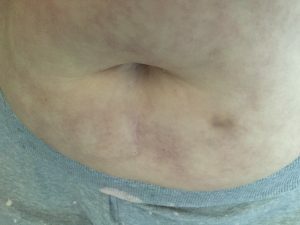 Rather than open his mind to what he doesn’t know, he said I had “constipation” rather than assess the mottled & burning belly as “livideo reticularis,” gastroparesis, Dysmotility, pseudo-obstruction form my CRPS insisting my feet, which are hanging over the side uncovered, be covered. So what’s a patient to do? Well I can share with you the positive side. Many nurses, physicians, and staff were thrilled to have the card and ER/Hospital protocol to read and pass on to the next shift. SO validating as a CRPS patient! But being prepared isn’t always enough. We need to continue to advocate for ourselves and others facing this condition. More importantly, we need to help “our care givers” to have the terminology to advocate for us when we can’t. Further education, protocols and advocacy must be given to hospital staff to expedite care. Contacting our local legislators to share our stories will enable future legislation to protect CRPS patients both in and out of a hospital setting. You might think your voice won’t make a difference. But I’m here to say “Yes it can!” Don’t wait, do it now. The more conversation we have the easier it will be. Together we are HELPING each other! Your voice, my voice, and RSDSA voice together WILL make the difference. It is my goal [that] ALL health professionals will receive expanded training on “chronic pain,” including the complexities facing those living with the challenge of CRPS.